DreamWorks Animation stock shot up more than 7 percent on Monday, driven by the stunning performance of “Home,” which captured the weekend box office crown with an estimated $52.1 million. 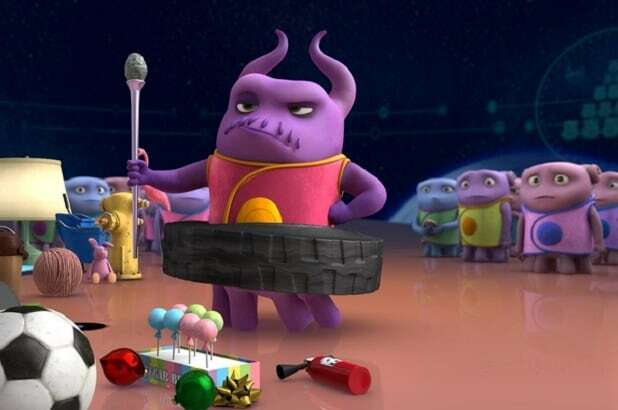 The debut by “Home,” a family film about a friendly alien invader and the teen girl he meets, came in roughly $20 million over analysts’ pre-release projections and is a huge win for the studio, which is in the midst of a major restructuring. Along with layoffs and selling its Glendale, California-based campus, DWA cut back its film slate as part of the recovery plan announced in January. With “Kung Fu Panda 3” pushed to next year, “Home” is the studio’s lone 2015 release, and DWA chief executive Jeffrey Katzenberg has said it must make money in order for the studio to have a profitable 2015. In its most recent earnings report, the company said it had lost $247 million in the final quarter of 2014. Rihanna, Jim Parsons, Jennifer Lopez and Steve Martin supplied the voices for the CGI animated “Home,” which was directed by Tim Johnson. One of the producers is Mirielle Soria who, along with Bonnie Arnold, was hired in early January as co-president of feature animation at DWA. “Home” was developed under the previous regime, but gives the studio some much needed momentum. Coming in to the weekend, four of its last six feature releases had disappointed. “Home” received an “A” CinemaScore grade from audiences, so word of mouth should be strong as more children get out of school for spring break. The critics have it at a so-so 48 percent positive on review aggregation site Rotten Tomatoes. The big debut by “Home” doesn’t get DWA out of the woods, cautioned B. Riley analyst Eric Wold, who kept the stock at a “neutral” rating. “These results do not eliminate the risk of a write-down and only reduce the potential for a write-down from 95 percent to 75 percent, given the incremental production cost, overhead allocation and marketing spend during the past five months since the movie’s delay from its original November 2014 release date,” he said.